You’ll start by making a simple frame out of the pvc pipe and joints (however big or small you need for your space). Once your frame is set along the wall to your liking, you can use some curved wire stakes over the pipe to help secure in the ground. 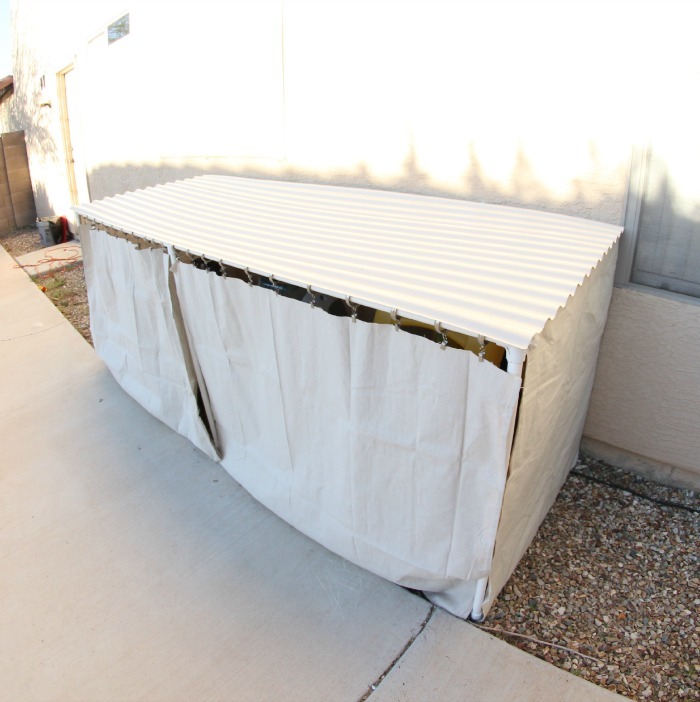 If you’d like your parking garage fully covered (like ours), then cut some drop cloth to size for the sides and attach (using screws or a heavy duty glue/adhesive). For the front, I slid on some clip rings (found in window treatments section at Lowe’s) to the front pvc pipe. Then, cut drop cloth to use as curtains for the front space as well. Once that’s done, you’ll attach the roof. Just take your roofing panel(s) so that the grooves rest on the pvc pipe well and screw it into the pipe in 2-3 different spots along the sides and back. And, that’s it! 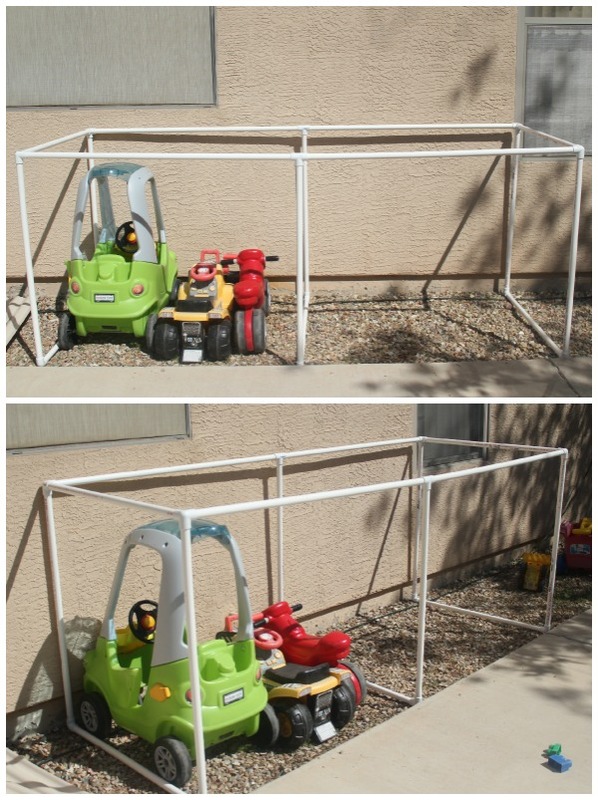 With just a bit of work and supplies, we’ve got a designated place for those toys that will really help them be better protected from the elements! 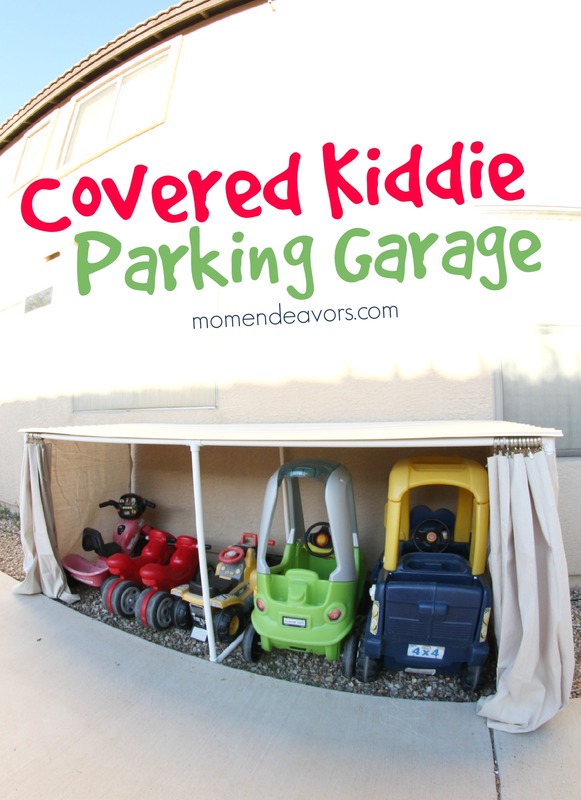 If you want to add some wall art, you could even make a cute kid car parking garage sign to go above! Then, in the summer, when the cars need some washing, be sure to build a kiddie car wash! It’s perfect for summer fun! 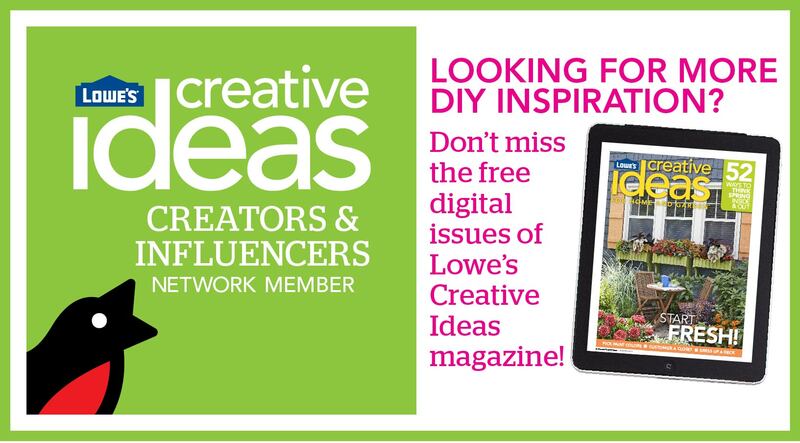 What outdoor organizational/decor ideas are you hoping to tackle this spring? Seriously. How cute is this!!! Great idea! 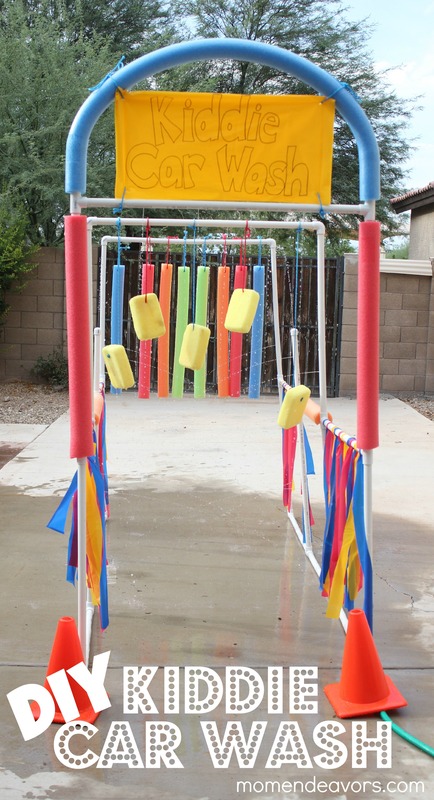 With the summer heat ruining most everything outside in Arizona, this is a great way to take care of all those fun ride on toys! I don’t suppose you could tell me the size of the sheet you used for the roof? I think yours looks like a great size. Awesome idea! Our Lowe’s only had one size, so we went with that. 😉 The size you’ll need totally depends on how big you’re making the space. Also, depending on the depth, you may need two panels. This is a great idea and so cute!! I thought I saw an AZ backyard when I saw that pic come up in my fb feed. (I grew up there.) What a great idea! I shared it on my page so my AZ peeps can see it. I know they’ll find it useful! How much did it cost to make this? I think this is fabulous! We live in Texas and have the same issues. I think if you built it higher it would be great for bike storage also. Now that my kids are getting bigger our garage is over flowing with bike, trikes and skateboards. Hi! You actually need pvc side outlet elbows. This is more difficult to make than it looks. Feeling overwhelmed!! But I’m going to try! Love this idea! 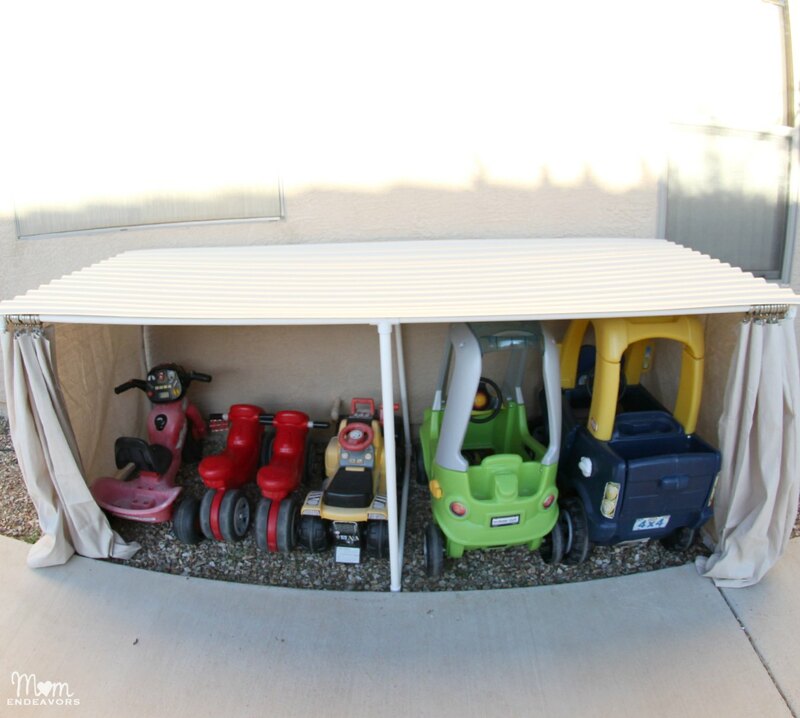 We are in the process of building my son a garage like this, but oh boy are those corrugated plastic pieces expensive! Has anyone seen them cheap? We live in the northeast and have snow to consider. We added a support post in the middle both down and across as well. We also put the roof at an angle (made the front poles just a hair shorter than the back so water and snow to run off. We also switch the roof ridges from horizontal to vertical to aid in the run off. We want to make this….just curious about how it holds up in the wind. Spring is quite windy here…about 15-20mph wind –on average– every single frikkin day. Eek! Not sure about that. We’re in Phoenix – so usually very little weather. Does the pvc really support the weight of the roof panel? Lowes has polycarbonate or pvc roof sheets but I am skeptical how that will hold up. We are in NC so occasional ice/snow and def wind and rain but the weight alone doesn’t seem like the pvc will hold the roof sheet. Did you fix this to a wall or lean against something. I need it free standing. any suggestions to make it more durable and long lasting? Having a hard time finding the roof material. All i can find is steel. Where can i purchase this?? Hmmm! Not sure, Jessica! maybe it varies by region. We bought everything at Lowe’s. Very clever solution! We live in Arizona too and I’m wondering how this has held up with the summer monsoon dust storms? Thanks! Sorry! Just saw this! We had one bad storm that part of it blew over, but that’s it! Wow! amazing idea for kids outdoor play. I really appreciate your ideas. It’s an easy and interesting way for kids toys storages. Thanks for sharing this idea. What do you do about mosquitoes hiding out under there? Wow! 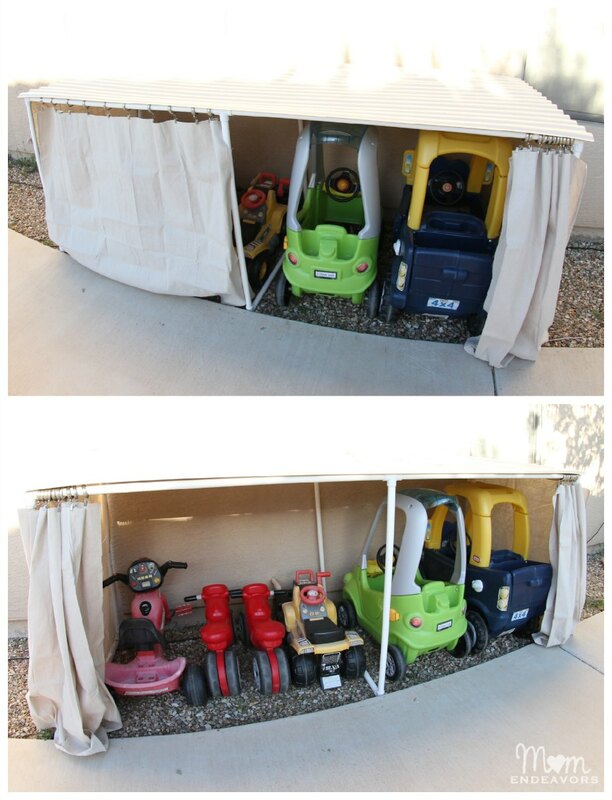 What a clever thought for outdoor toy storages. simple and unique ideas really. Thanks for sharing this idea.